Victoria: Rocky Mountain books, 2016. In At Sea with the Marine Birds of the Raincoast, conservation biologist Caroline Fox (at right) crosses thousands of kilometres of open ocean to chart the distribution and long-distance migrations of North Pacific marine birds including albatrosses, puffins, and shearwaters. Fox considers the conservation challenges, past and present, faced by these remarkable pelagic birds, many of which were hunted for food, feathers, or sport. At Sea with the Marine Birds is shortlisted for the 2017 Basil Stuart-Stubbs prize for outstanding scholarly book on British Columbia. – Ed. A beautifully-written little book, At Sea with the Marine Birds of the Raincoast packs an extraordinary amount into its 272 pages. Complete with hi-res photographs and jam-packed with witty anecdotes and vital information, it provides a series of mini-histories on a broad selection of British Columbia’s coastal sea birds. It is a compelling hybrid of sorts: part field guide, part animal history, and part personal journal. 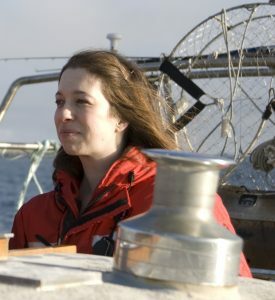 The narrative has a rhythm like the ocean itself, gently rolling along transect lines as we follow Caroline Fox on the bow of the Achiever, where she works as the Raincoast Conservation Foundation’s resident bird expert on research trips to survey the density and distribution of British Columbia’s coastal marine birds. 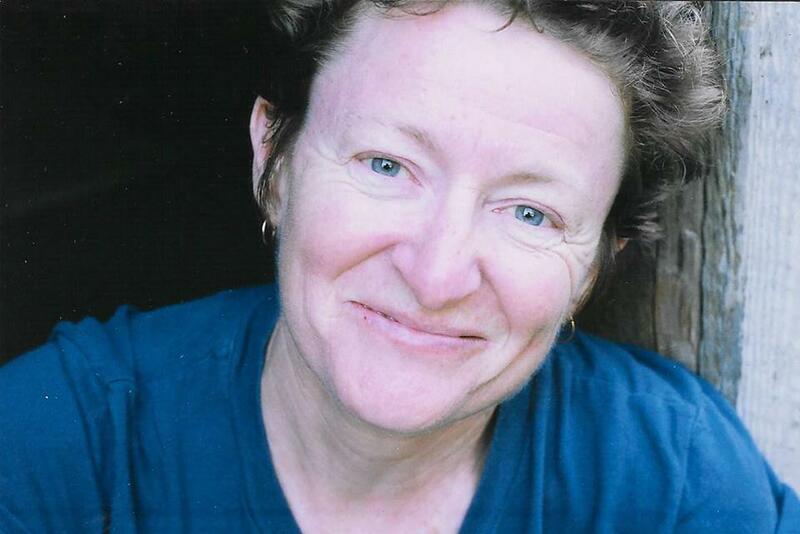 We share her journey, weathering the elements on deck as she catches a fleeting glimpse of her avian subjects, from sooty shearwaters to sandhill cranes, puffins, ravens, surf-scoters, and peregrine falcons, each providing a visual prompt for mini-histories of individual species. But don’t let the pleasure of reading this enjoyable narrative fool you: Fox’s story has as much depth as the open ocean. More than a journey to simply document these birds, it draws on more complicated and urgent forces as her narrative, and the Achiever, move farther along. Underlying the exhilaration of coming face to face with rare birds is a story of loss – through environmental degradation, changing ecosystems, and extinction events. The Achiever anchored beyond the bull kelp at Warrior Rocks, Hecate Strait. Heidi Krajewsky photo. 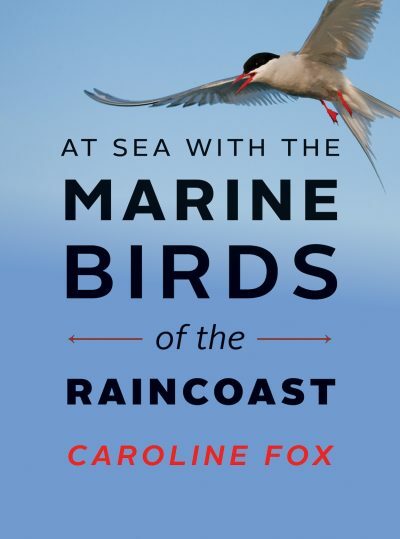 Ultimately, this book illustrates the complicated relationship humans have formed with the birds of our coast, as well as our paradoxical urge to save what we destroy and the persistence of marine birds to adapt to the changes we have forced upon Canada’s outer Pacific coast. Part of the book’s effectiveness is Fox’s personal narrative. Fighting through sleep deprivation and freezing winds, her joy at encountering rare species is all the more palpable. 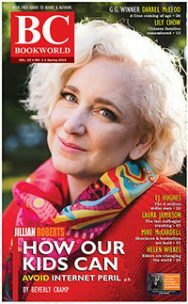 Her candid enthusiasm — she describes herself as “losing it” when she first sighted the rare short-tailed albatross — offers a window into those eureka moments of oceanic bird research (p. 145). Yet Fox always tempers the thrill of encounter with a more serious tone. An adult short-tailed albatross. Photo courtesy of Kirk Zufelt. 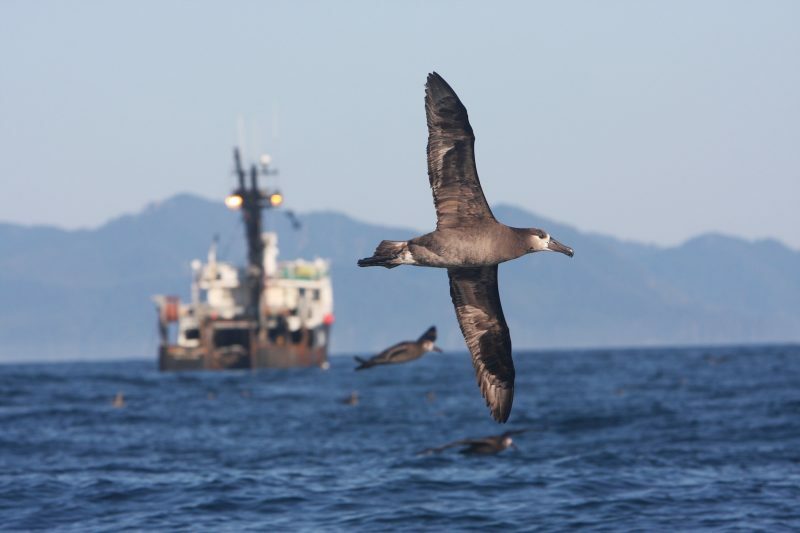 Once a regular visitor to the coast of British Columbia, short-tails were probably the most common albatross. Their bones have been found in Nuu-cha-Nuulth middens, proving their long-term cultural importance to the region. 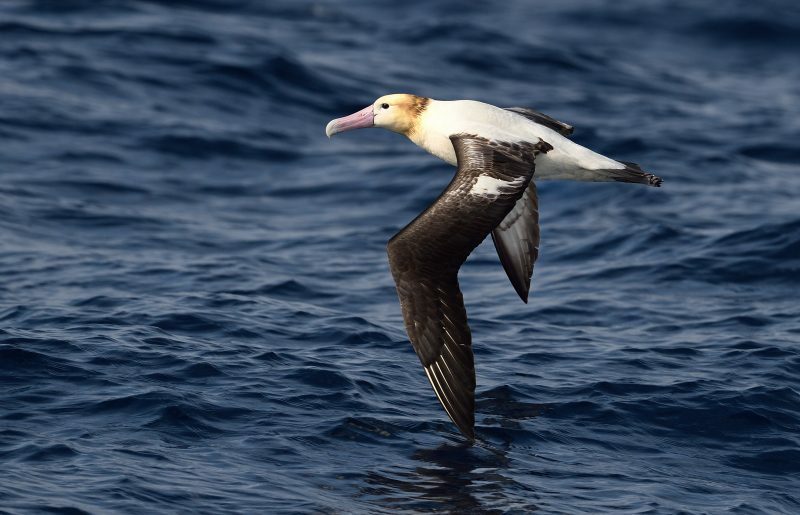 With an unusual pink beak, golden hued plumage, and two-metre wingspan with locking shoulder joints enabling hours of sustained gliding along the winds of the offshore, the short-tailed albatross is a powerful portrait of ancient avian grace and a master of the open ocean. Once a distinct feature of the British Columbian coastline, by the mid twentieth century these “fifty-foot seagulls” were declared extinct. During the height of the nineteenth century feather trade, hunters decimated populations in the breeding grounds of Japan’s Torishima and Senkaku islands. The giant albatrosses were no match for the onslaught and an estimated five million albatrosses were killed on the island colonies, a project undertaken with such rigour that a hand railway was constructed to cart the piles of dead birds to the ships. Almost as soon as this bonanza had begun, Torishima Island became a very quiet place and only the ghosts of the short-tails remained. The traffic in feathers ended and the giant birds were presumed extinct (pp. 146-148). Yet, Fox writes, nature provided its own particular plot twist to this story. Years after the bird colonies were decimated, young adult short-tails began to return to the islands (p. 148). Their saving grace was their long lifecycle, which included a six-year rite of passage on the open water. Having spent their teenaged years soaring over the seas, they had finally returned to mate at the place they were born. This survival strategy, encoded into its DNA through a long breeding cycle, enabled the albatross to escape total destruction. After this near extinction event, conservation laws were put in place to protect this phoenix-like avian revenant. Black-footed albotrosses attracted to a fishing boat on west coast of Haida Gwaii. Photo courtesy of Jared Towers. The short tailed albatross survived and is currently revered as a protected species and a National Natural Monument in Japan. Its survival illustrates a common aspect of the relationship between human and bird. Namely, our propensity to hunt or harvest unsustainably, the marvellous adaptability and capacity of hunted creatures to survive, and our paradoxical urge to protect them once we have driven them to the brink of destruction. Fox presents these ideas to illustrate how these far-flying birds, long absent from our shores, are embedded in the history of this coast. 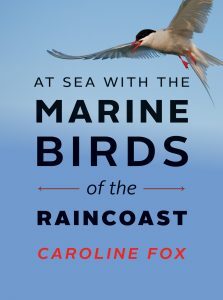 Stories like this recur through At Sea with the Marine Birds of the Raincoast as Fox weaves a complex narrative to illustrate the tension between destruction and conservation with every bird she considers. Some were threatened not so much by overt over-hunting as, inadvertently, by the more subtle ways in which humans can alter their environment. The ancient murrelet is an example. These were the “night birds” of the north coast known for their playful nature and unique call. Of tremendous cultural importance to the Haida, ancient murrelets were seasonally harvested by lighting bonfires on beaches to attract the curious birds to the shore. The Haida then hunted the disoriented birds. The sustainable harvest of murrelets, a Haida Elder noted, was an important community activity that provided “enormous glee” and a delicious and reliable food source (p. 87). While the relationship between the Haida and the murrelets was a sustainable one, their breeding colonies were threatened when raccoon farms were introduced to bolster the fur trade on the islands of Haida Gwaii (p. 90). This experiment was a disaster; the raccoons preyed on the murrelets in their nesting burrows. In response, eradication efforts are underway by Coastal Conservation and by one of Canada’s longest sustained breeding monitoring programs, undertaken by the Laskeek Bay Conservation Society (pp. 90-91). 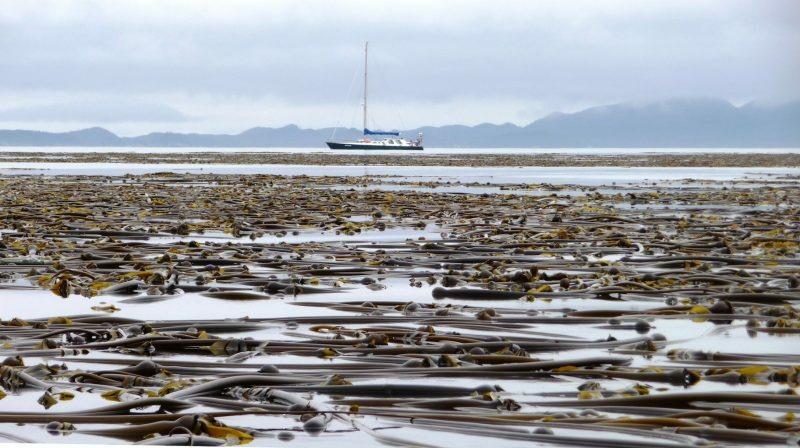 The introduction of invasive species wasn’t isolated to Haida Gwaii. Many bird populations and breeding colonies on the coast have suffered from the introduction of alien species including cats, foxes, and rats (pp. 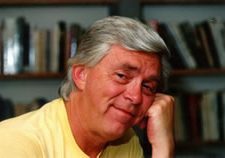 90-91). 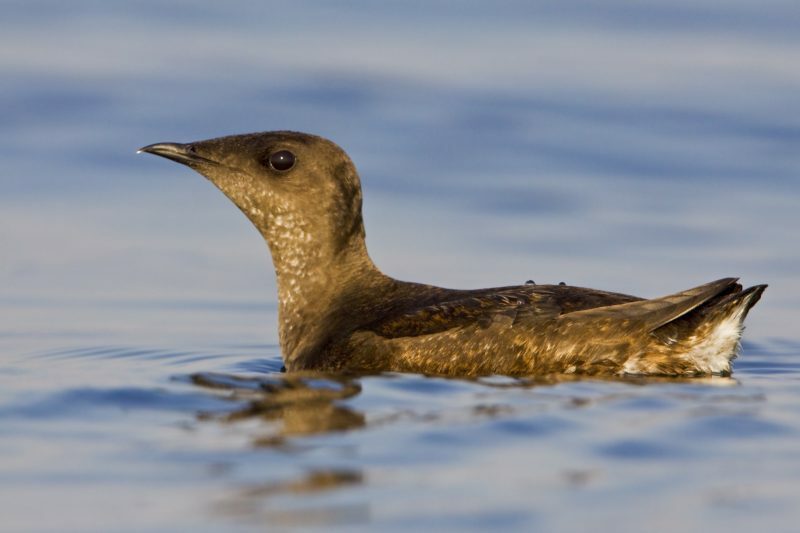 Despite intensified monitoring and conservation efforts, Fox notes that ancient murrelet populations continue to decline. We can only hope they can recover. The mini-histories of the birds she encounters are fascinating, informative, and moving. My only critique is that I wanted more — an impossible feat in a book that undertakes such a broad survey across a multiplicity of species. Throughout Cox’s multiple biographies of birds lies a more urgent message: that of large-scale loss. From the DDT scandals that decimated bald eagle populations to the biocide of the short-tailed albatross, to the decimation of vital marine habitat, all species have been affected somehow by the invasive touch of modern humankind. To complicate the documentation of this relationship, Fox identifies two detrimental factors. The first is our inability to measure the effects we can’t see, such as dredged ocean floors and climate change. The second is our own fleeting memory, which Fox calls our “shifting baseline syndrome,” an intergenerational amnesia in which each generation assesses decline within the context of its own lifespan, without reference to previous benchmarks (p. 90). Coupled with the historical shortage of bird documentation for the open ocean, it is very difficult for scientists to measure past population declines and equally hard to fathom the obstacles to survival for marine birds. 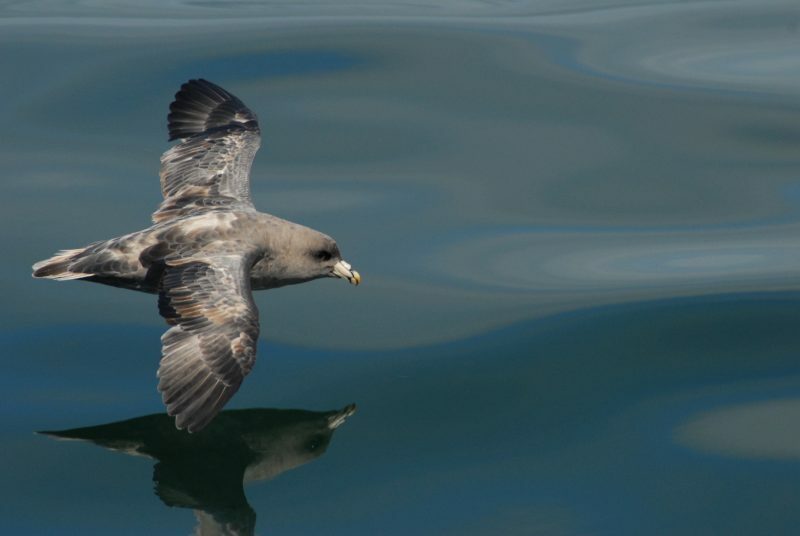 A northern fulmar at sea. 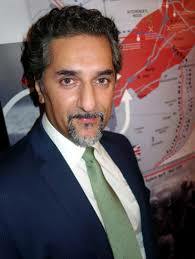 Photo courtesy of Peter Hodum. At Sea with the Marine Birds of the Raincoast provides much for coastal residents to meditate upon as we hike the coastline, take BC Ferries through Active Pass, or otherwise encounter these bird species. This book helps us recognize the stories behind these animals. Finally, Fox looks to the future with a mixture of hope and foreboding. While hopeful that surveys like hers will help promote awareness and future conservation efforts, she is wary in the face of the ecological destruction caused by humans – which can only continue in the years to come. Logging in the Great Bear Rainforest, the cascading impact of climate change, continued overfishing, and the recent approval of the Kinder Morgan pipeline — these actions will affect the lives of all the sea birds that make their home on the coast. One hopes that the stories in this book will serve as useful reminders and examples of how to cultivate more sustainable relationships with the marine birds with which we share our home. 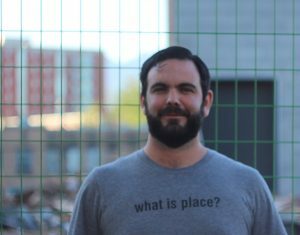 Sean MacPherson is a historian, filmmaker, and musician in the Mount Pleasant neighbourhood of Vancouver. He received his BA at the University of British Columbia in 2016 and is currently pursuing a Masters at the University of Victoria. 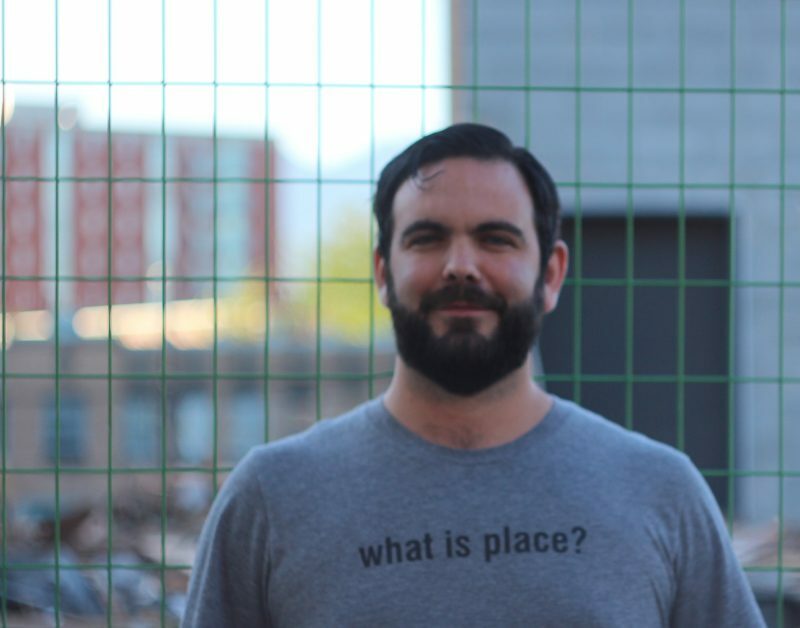 His research takes place in Western Canada and the East Kootenays in particular, involving First Nations and Environmental history as well as the legacy of colonialism and its impact on the western landscape. His other interests include urban nature, buried creeks, and the history of places.